Join us for the Academy Award-winning film by Miloš Forman that inspired the exhibition Amadeus: Costumes for the Obsessed and Vengeful! 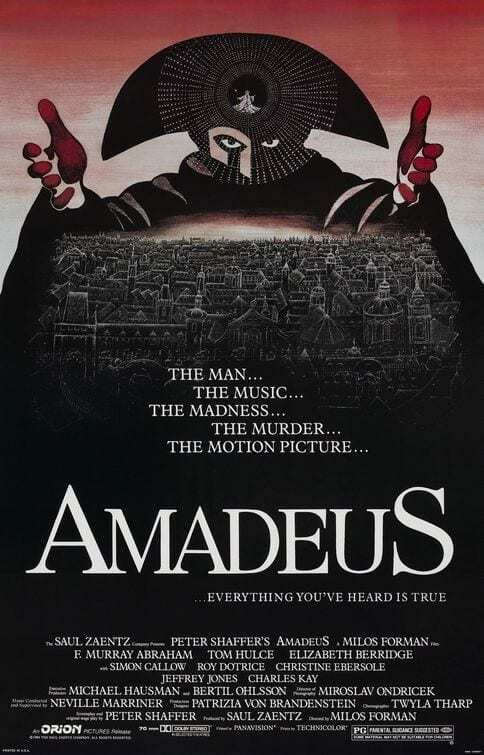 Synopsis: Wolfgang Amadeus Mozart (Tom Hulce) is a remarkably talented young Viennese composer who unwittingly finds a fierce rival in the disciplined and determined Antonio Salieri (F. Murray Abraham). Resenting Mozart for both his hedonistic lifestyle and his undeniable talent, the highly religious Salieri is gradually consumed by his jealousy and becomes obsessed with Mozart’s downfall, leading to a devious scheme that has dire consequences for both men. Rated R, 1984, 161 minutes. In English. Original poster art by Peter Sís.